Interested in a FREE Siding ESTIMATE? Like conventional siding, fiber-cement siding is applied to the exterior of buildings to protect them from the elements. This product comes in a wide range of colors and styles that resemble conventional siding materials, notably stucco, cedar shingles, and wood clapboards. It’s made primarily from cement, sand, and wood fiber (often a recycled wood-fiber waste product), a combination that results in an extremely durable material. Fiber-cement siding typically costs a bit more than vinyl siding, but less than stucco. It also outlasts its competitors — often by decades — because it resists many common hazards, including fire, wind, insects, and rain. Fiber-cement siding is recommended in all climates, but is ideal for hot, humid regions. No matter how wet it gets, it won’t rot. And because of the cement and sand content, it’s termite-resistant. Because of its durability, fiber-cement siding reduces maintenance costs, and it’s less likely than conventional siding to end up in landfills. Unfortunately, there are currently no recycling programs in place for fiber-cement siding. However, it is an inert material that, if ultimately sent to a landfill, should not endanger the environment. James Hardie® fiber cement products combine beautiful design with high performance. Time and time again, they beat out competitors on both curb appeal and durability. Enter your Zipcode below to see all of your available James Hardie options. A.B. Edward is a James Hardie Preferred Remodeler. James Hardie fiber cement siding is an extremely durable and long-lasting product that will easily withstand the harsh weather conditions that are common in the Chicagoland area. Fiber cement siding is often considered to be the most beautiful and durable home cladding on the market. This style of siding offers numerous other benefits as well, including resistance to moisture intrusion which can eventually lead to such problems as mold, expansion, buckling, cracking, and shrinking. Fiber cement siding is also the most fire-resistant option that is currently available. This will allow you to rest easy about your family or any of your valuable assets being exposed to fire damage. Fiber cement siding is also available in many different colors and textures to provide a beautiful look that doesn’t require any of the upkeep of other materials. James Hardie products are also backed by a 50-year limited transferable warranty, so you can be sure that your investment will be protected for years to come. If you are ready to update your home in Des Moines, IA, or a surrounding area to superior James Hardie fiber cement siding, turn to the experts at Waddle Exteriors. We were established in 1978, and have a full staff of experienced installers that have been trained specifically in the installation of fiber cement siding. When your siding is in need of repair, our expert contractors can provide the comprehensive repair services you need. We will fully restore your siding to its original condition so that you can enjoy an improved appearance for your home. Our goal is to ensure our customer’s satisfaction with premium siding solutions. 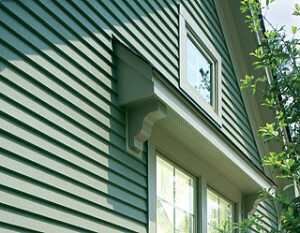 James Hardie siding in Chicago has always been ahead of the siding industry curve. James Hardie® products are available with our proprietary ColorPlus® Technology formulation. Our ColorPlus® Technology combines paint optimally formulated for use with fiber cement and a professionally developed color palette. The multicoat, baked on, factory application process delivers beautiful, consistent, finished James Hardie® products to your job site. – According to a report by a leading home-improvement magazine, adding fiber-cement siding to your home is the #1 way to get the return on your investment. Longevity: Most hardie board siding comes with a 50-year, limited transferable warranty. This siding is completely rot and insect resistant and can even handle salt spray from the ocean. Appearance: Hardie board siding can be made to mimic just about any other siding material, including wood lap boards, cedar shingles, and wood shake siding. Color options are virtually unlimited. These colors are accompanied by a 15 year warranty on the finish. How does James Hardie Siding Compare?